If you’ve ever looked at a mindbending, impossible piece of architecture designed by M.C. Escher and thought, well, I would love to play that, then you just might love Back to Bed, a video game for Windows, Mac, Google Play and Playstation. Similar to last year’s aesthetically beautiful architecture puzzle game Monument Valley, players make their way through 30 levels of increasingly difficult landscapes. You play a dog-like companion that tries to stop his sleep-walking owner Bob from falling off into space by placing objects in his path. But, as with these games, you must use logic to access some of the objects and thinking several moves ahead stretches the brain. The giant, green apples recall Rene Magritte, melted watches are out of Dalí, and the voice that says “The stairs are not what they seem”? We have another Lynch fan in Bedtime Time Digital Games' crew. And the whole narcolepsy theme has a bit of the ol' Caligari going for it. The small company consists of former students who created the game “in a freezing old warehouse on the harbor in Aalborg, Denmark,” according to their bio. They forged ahead with the game after a Kickstarter campaign and what sounds like many years later, they won the student showcase at San Francisco’s Independent Games Festival. That attracted investors and with actual funding, they’ve rewritten the game to make it really shine on HDTVs. 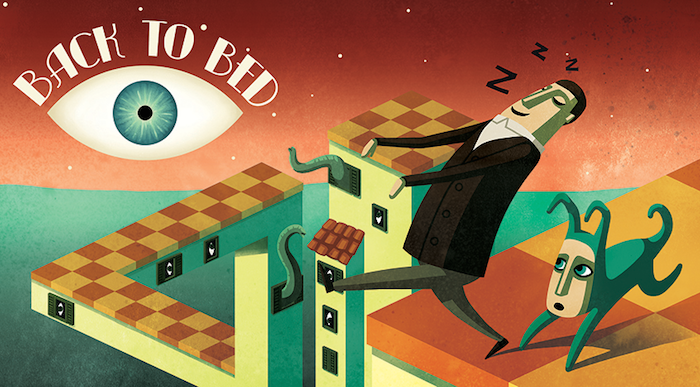 Despite the suspenseful gameplay, there’s much that’s relaxing in the worlds of Back to Bed, from its children book graphic design—everything looks airbrushed—to its hypnotic, hypnagogic sound, including a very Brian Eno-esque ambient soundtrack. "Back to Bed, the game says out loud in a drone, half-awake voice when you finish a level. But this addictive game might just keep you up later than usual. This game is indeed beautiful and pretty fun, but considering I bought this about a year ago what exactly do you mean by “new”?